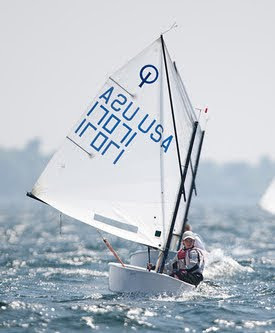 LISOT's Harry Koeppel (USA 17071 - Larchmont YC) sits in 4th place overall after and 6 races (1 discard) over 2 days of racing at the 2010 IODA North American Championship in CORK, Canada. Harry (Photo right, by Dave Hein) checks in with 28 points and is tied with Team USA teammate Duncan Williford (Lauderdale YC) for 3rd in the 196 boat fleet. Harry and Duncan (who are both on the TeamUSA World Team) are a mere 2 points ahead of their friend, Bermudian Sam Stan, in 5th, who has sailed with LISOT over the years. Defending NAs champion and Team USA World Team member Christopher Williford sits atop the leader board with a mere 11 points, including bullets in races 5 and 6. Conditions have been varied between light air on day 1 to a solid 15-20+ knots on Day 2. Tomorrow is Team Racing, after which fleet racing picks up again on Friday (Thursday is a layday). Team USA, with LISOT's own Pepe Bettini as co-head coach, currently has 7 sailors in the top 10, including Ali Toppa as top girl. Go LISOT. Go Team USA.